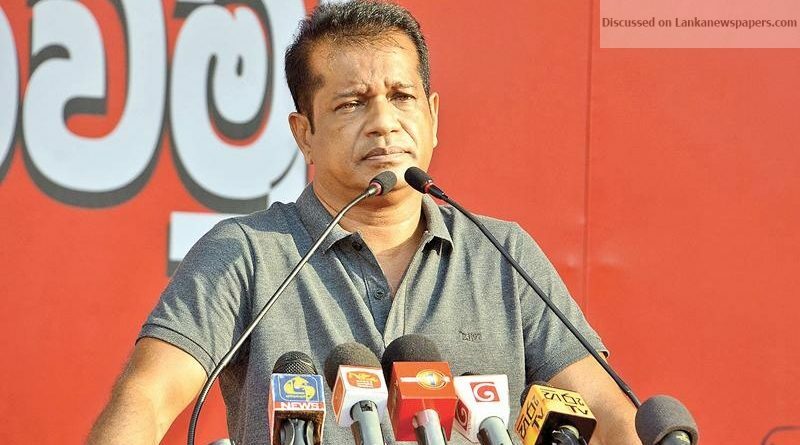 Firebrand JVP trade union leader and politburo member K.D Lalkantha has constantly voiced his support for expedited general elections and a change in government. But, as the JVP approached courts against the declaration of general elections to be held in early 2019, it caused confusion among the populace. Lalkantha however maintains that the JVP is still in favour of holding general elections despite the recent objections, proposing it as the only solution to the current political stalemate. In an interview with the Sunday Observer, Lalkantha speaks about the party’s continuous support for early general elections, their reservations, rumours regarding cracks within the party and about the now forgotten 20th Amendment. Q: What is the JVP’s proposed solution to the current political deadlock? A. Legitimate and expedited general elections are the only solution the current political conundrum. It is only through a general election that stability can be restored. Despite what kind of situation would be created thereafter, the current stalemate can be resolved only through a legitimate general election. Q: Earlier this year speaking to our sister publication Dinamina you were quoted as saying that general elections must be called to make a change in government. However, following the dissolution of Parliament and general elections being declared,the JVP approached the courts to have the decision scrapped. What is the rationale behind such a move? A. After the last Local Government elections, the country appeared to be heading towards anarchy. Facing this situation the JVP constantly proposed that general elections must be called to stop this downward spiral. But the method by which general elections should be declared is by obtaining a two-third majority vote in Parliament, and informing the President, after which he would dissolve Parliament. That process is clear. Therefore, the JVP cannot agree with the decision to call for an election without following the proper procedure. While we agree that a general election must be held, it must be done according to accepted procedures. Q: The JVP’s actions recently have earned much flak as they are seen to be in support of the UNP. Is there any truth to this? A. The JVP’s actions recently to defeat the existing Government may inadvertently appear as helping the UNP to establish a government. We admit this and it cannot be avoided. However, the survival of the UNP Government must also be terminated. That is why the JVP has been continuously calling for an election. You don’t see the UNP calling for elections as they merely want to protect the Premiership of Ranil Wickremesinghe and continue with a UNP Government. The JVP is not agreeable to this. Both governments must be sent home. Only a general election can protect the people’s constitution and law and order, to bring an end to the traitorous UNP Government as well. Anyone can level accusations against the JVP without looking at the whole picture. Q: But won’t these accusations affect the JVP’s vote base negatively at the next general elections? A. No, I believe votes for the JVP will increase. The party is against both, the current and former government and we have been working to ensure their fall. People who understand the JVP’s motives and decisions will stand with the party. Die-hard supporters of other political parties may not vote for us, however, we believe reasonable citizens will appreciate the efforts of the JVP. Q: What is the JVP’s preparation for the next General Elections? A. As a party, we are constantly preparing for elections while continuing with our political activities. Normally, at least one election is held in a year and therefore, the JVP works with a plan towards increasing our voter base. We have no objections to a general election being held and will support it. Q: In the current scenario what has become of the 20th Amendment to the Constitution proposed by the JVP? A. In the prevailing state of affairs, the discussion regarding the 20th Amendment which sought to abolish the executive presidency in its current form has fallen by the wayside. It can only be taken up again following a general election. Once Parliament is prorogued previous proposals are nullified. The proposal will have to be presented once again during the new parliamentary session. But the current chaotic situation will have to be rectified prior to such a move since it is the priority now. Q: The Frontline Socialist Party recently called for all leftist parties to form a leftist force and coalition. Has the JVP responded to their proposal? A. We have not responded to this. At times like these parties who try to portray themselves as being leftists often make such suggestions. But the JVP now believes in going beyond the leftist forces and building a broad progressive force instead. Leftist parties merely coming together is not powerful enough in the modern day. Q: Certain media continue to hint at a split within the JVP using the various contradictory statements made by its members, including yourself. Is there any truth to these conjectures? A. There are various political elements that wish for a split within the JVP. These elements pick and choose from what is being said by our members and use them to create a perception that the party members have divergent views. They then proclaim that there is infighting within the party. This is not a new phenomenon but that does not mean there is any truth in it.